Do you dream of finally getting organized and having a tidy home where you can relax and not feel stressed out? You are not alone. I know that I’ve felt that way many times and that there are lots of people out there feeling the same way. 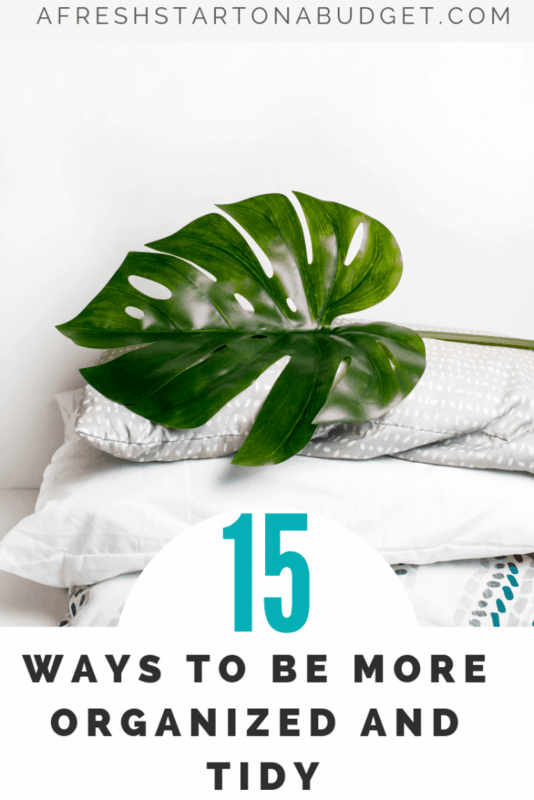 That’s why these 15 ways to be more organized and tidy are so helpful. You will see that it is a combination of a few easy things that can finally get you to be organized. Even when you can’t commit to doing it all the easy ways to be more organized will start improving your home even if you are only doing a few of them. Getting rid of clutter is one of the best ways to be more organized that I have found. We all have too much stuff that can leave our homes feeling stuffed and messy no matter how much we organize. That’s why decluttering is the key to being organized. Don’t know what to declutter? Start with this list of more than 80 things to declutter today. One of the biggest obstacles I’ve heard from people trying to get organized is that they feel overwhelmed by it. That is why it is so important to remember to do a little at a time. Put away one load of laundry, do the dishes nightly, sweep and mop the floors, etc. Just get done what you can get done and those little bits will add up. When I am consistent about doing a little every day my home is so much more organized and tidy. When you allow yourself to get stuck in being overwhelmed that’s when nothing gets done and it just gets worse. This can be such a great way to keep up with organization. Just make more effort to clean up as you go. Doing this is a great way to maximize your effort and get the most done in your home. It can really be effective when I make the decision to not waste trips around the house but instead if I’m in the living room and heading to the kitchen to glance around me and see if there is anything in the living room that needs to go to the kitchen and bring it with me. If you are already heading to another part of the house take things that need to go that direction with you and put them away. Also if you are t something in the oven for 20 minutes and are going to have to wait for it to bake. Take those 20 minutes and do the dishes, pick up the kitchen. Start doing things as you go through your day and I know you will be pleasantly surprised with how much gets done without you realizing it. This is one area I’m really working on in 2019 to get my home and life more organized. I’m not very good with setting and sticking to a routine so it’s a goal of mine to get better at this over the year. I’m working through Crystal Paine’s Make Over Your Mornings course currently and hoping that it will help teach me what I need to know to establish better routines. My goal is that I will make organization a more routine part of my family’s life and that it will help us to keep up with home tasks by making them a regular part of the schedule. I know that we all like stuff and especially in our culture and world obtaining more is the goal but the truth is that we can live with less and still be quite happy and content. Check out 24 reasons why you can be happier with less. This is absolutely something I believe in and know to be true but just like most people, I need to be reminded of this from time to time and end up acquiring too much and need to declutter periodically. I’m always happier after decluttering too because having less is just more peaceful and makes staying organized easier. When you declutter and start living with less you will begin to fit better in your space no matter how big or small your home is. You also can make it so that everything has a place for it. This will end up saving you so much time and frustration. When you need to clean up you and your family will know exactly where something should go because it has a specific spot. Also when you need something you won’t waste time looking for it because it was put somewhere random. I honestly can’t tell you how many times I have been searching for something that I think should be in one place but that my husband has put somewhere crazy. I grew up having chores to do at home and of course like all kids I complained and never wanted to do them. Now though as an adult I understand that everyone needs to be involved in keeping the home organized and tidy. If you are looking for ways to be more organized and you don’t have your partner or children help with chores than that’s a good place to start. Of course, they don’t want to and to be honest you probably don’t want to clean either but you do because things need to get done. So it’s important that everyone who lives in the home help with keeping it tidy. If you have older kids here are some great chores to give your teen or tween. My daughter is 12 and she hates doing chores but I keep on pushing her to do them because someday she will be on her own and it’s important she knows how to do things around her home. I really try to clean for at least two 20 minute periods a day. That way I know I’m going to get something done and it breaks up my day. I will be working for a while then I will stop and do a little cleaning. Or if I watch TV I will watch an episode clean then go back to relaxing. I can’t physically be up for extended periods of time, so 20 to maybe 30 minutes seems to be my sweet spot. While you can’t clean a whole house in 20 minutes. You’d be surprised what can get accomplished. In 20 minutes I can start the laundry, picked up my bedroom, emptied the litter box and started dinner in the crockpot. The second time I did 20 minutes I did the dishes, picked up the kitchen wiped down the counters and stove, vacuumed and picked up the couch and end table. Even if that is all I do for cleaning in a day at least, I can feel good about that. Really for me having dishes washed and the carpets vacuumed are the big things. When you set a timer it lets you know that you only have a small amount of time and it encourages me to try and get done as much as I can in that period. It’s often surprising how much can be accomplished in a short burst of time. One of the best ways to be more organized quickly is to clear flat surfaces first. These typically take up a large area of a room like kitchen counters, dining room table, beds. So when you get them cleaned off and organized the rooms they are in will look much better. So when you start cleaning a room that has a flat surface get that done first so that you can easily make the room improved and then start doing your other cleaning tasks. I find that getting a cleaning win at the beginning of a room can be motivating to keep organizing. This is why I try to make the effort to make my bed every morning. That way when I go in and out of my room throughout the day it at least looks semi-cleaned up. This small task takes two minutes and can make such a big difference. We tend to overestimate the amount of time that chores and tasks will take us and then become more likely to put them off because we don’t think we have the time to do them or we don’t want to spend the time doing them. So that’s where the 3 minute rule is really helpful. If you see a task that needs to get done and you feel like blowing it off or just doing it later. Ask yourself will this take me 3 minutes or less? If the answer is yes then just do it. 3 minutes is not that long and then it will be done. Doing this and sticking to this rule helps little tasks from piling up and becoming much bigger and longer tasks. It’s something I’m really trying to get my daughter to follow. That taking 3 minutes and just doing it now will save her time in the long run. I learned this rule from Melissa Maker author of Clean My Space either from her book or in her videos. It’s a great rule. That I have found it to be very true when it comes to cleaning and being organized. If you have a clean sink either in the kitchen or bathrooms. Then the space around the sink will be more likely to stay clean. So if you take the time to clear out your kitchen sink your kitchen will likely stay more organized. If you wipe down your bathroom sinks your bathrooms will be more likely to stay neat. It’s not a hard task to do and if you make the effort I believe that like me you will find this to be true. If you hate cleaning and dread having to do it. Then you probably won’t get around to doing it as often as you should. That’s why you need to try to make it as enjoyable as it can be. Then you will be more likely to make more time for cleaning. These 13 ideas from show Me Suburban are great ideas for making cleaning more fun. If you go on Pinterest and look up organized homes you will see pantries and closets full of cute containers or bins all organized to perfection. So when we want to get organized it seems so easy to go out and buy new pretty storage bins to help us get organized. That can not only get expensive but new bins won’t actually help you be any more organized. So first declutter and get organized. Then try to use what you already have before you go out and buy new containers. Obviously, I don’t mean that you shouldn’t bring any new things in your home. I assume you will still be shopping from time to time, receiving gifts for birthdays and holidays, if you have kids they are constantly bringing home art and school papers. What I mean is to first set boundaries of how much can come in. With kids stuff, it needs to be able to be contained to one space and new stuff in means old stuff out. Say no to buying things that you don’t need just because it’s on sale. You don’t need the clutter and this will save you money. When you are looking for ways to be more organized it can become overwhelming because there is so much to do and you want to get your home looking great. To feel less cluttered and more organized. That’s when it’s important to remember that done is more important than perfect. That it’s better to have taken the time and effort to declutter and organize your closet and that it’s now done. Even if it’s not perfect. Perfect isn’t a reality of the time. Even those Instagram and Pinterest worthy pictures that make homes look amazing and perfect aren’t always showing you the truth. Clutter was picked up and straightened just before that picture was taken. If you are aiming for perfection then your home is never going to feel organized enough. There will always be something wrong with your home and that’s a crummy way to feel. So relax your expectations a little and remember getting your home organized and tidy is the goal, not having a perfect home. Well, there you have it 15 ways to be more organized and tidy. Believe me, no matter what level of organized you are these tips will help. I hope you find them easy to follow and implement into your day. Take the free 7 day Get Organized challenge!